Blutooth V4.1,easy to pair with cell phones, tablets and other Bluetooth enabled music device. The control panel built- in stereo speaker and microphone on left earpiece,you can skip your phone. 6 hours talking/playing time,2.5 hours charging time,60 hours standby. Fully Washable:One size fit most and washable after removing the headphones from the pouches. 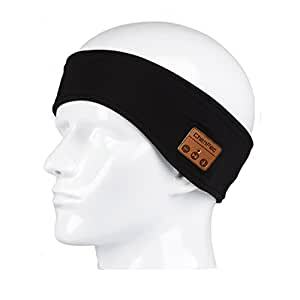 Tips: 1.Before you start using the bluetooth headband,please use the USB cable to charge it first. 2.Pairing:press the ON/OFF button of the control panel. 3.Make sure you turned on the bluetooth on your phone,search headset model on it.